With Matt Garza and Jason Bartlett now in Tampa Bay and Delmon Young and Brendan Harris now in Minnesota, the Twins will now continue to focus on a trade for Johan Santana and possibly Joe Nathan. The talks yesterday morning were that the Mets were considering a swap for the 2-time Cy Young Award winner for young All-Star shortstop Jose Reyes and others. I would love to see Jose Reyes in a Twins uniform, but I don't believe the Mets will do it. Despite the fact that they would still have a very good offense without him, the fact that Reyes is signed for a very reasonable contract makes him likely off-limits (at least for now) in any Johan Santana trade. Then in the afternoon, a report that our friend Shooter Charley Walters reported in the morning of the Red Sox moving into the lead for a Johan Santana trade picked up steam. The rumored deal reportedly would give the Twins left-handed pitcher Jon Lester as the centerpiece. Joining Lester would be outfielder Coco Crisp, shortstop prospect Jed Lowrie and a pitching prospect which would either be Justin Masterson or Michael Bowden. From a Twins perspective, I really don't like this trade. Lester although has potential, probably won't ever be more than a back-of-the-rotation starter, Crisp isn't anything special, and Bowden nor Masterson are ready and both don't have that high of ceilings. Lowrie on the other hand is a great shortstop prospect who I do hope the Twins trade for since Jason Bartlett's departure leaves the Twins with yet anyother hole in the infield. Lowrie would be ready to take over on opening day and would become the Twins short stop moving forward. He gets on base at a very high frequency and is an ideal #2 hitter for the Twins. He also has a solid glove which the Twins would also like to have at shortstop. Unless the Red Sox substituted Jon Lester with Clay Buchholz or unless they substituted Coco Crisp with Jacoby Ellsbury, I don't see the Twins accepting this offer. Although crazier things have happened. There is no current speculation of where Nathan may or may not end up, but I have an interesting proposal. But before I explain it. I want people to know that I'm just thinking a little outside "the box" and I do realize that these two deals may be a little far fetched. Lets just hypothetically say that the Twins hold off an any deal and the Red Sox and Yankees continue to drive the price up for Santana. Finally the Yankees offer Robinson Cano (and yes, I do know that he's untouchable at the moment), Ian Kennedy and Jose Tabata. The Twins reluctantly accept the offer and get a replacement for Santana in Kennedy, an all-star in Cano and a very good outfield prospect in Tabata. The Twins then turn and trade Joe Nathan to the Red Sox who could possibly look to move Jonathan Papelbon to the rotation as they lost out on the Johan Santana sweepstakes. The Red Sox then turn and trade Coco Crisp, Jed Lowrie and Manny Delcarmen for Nathan. The Twins then receive their new center fielder for '08 in Crisp, their short stop in Lorwie and a good bullpen arm in Joe Nathan. It may be appealing to the Red Sox who would like to move Coco Crisp and would have enough pitchers to make Delcarmen expendable. The Twins new lineup is as follows: CF - Coco Crisp, SS - Jed Lowrie, C - Joe Mauer, LF - Delmon Young, 1B - Justin Morneau, RF - Michael Cuddyer, 2B - Robinson Cano, 3B - Brendan Harris, DH - Jason Kubel. I personally think that is a very strong lineup with a ton of potential. What do you think? Am I nuts (probably)? Or do you think a deal like this could be realistic at some point? As I posted yesterday, the Twins and Rays have now agreed on a deal which would center around outfielder Delmon Young of the Tampa Bay Rays and pitcher Matt Garza of the Minnesota Twins. This shouldn't sound too new to any readers as I've mentioned this deal a few times on this blog over the course of the off-season. Although, I never mentioned any other players being involved in a deal. At least, nobody specific. The deal is now a 6-player swap which will also bring the Twins infielder Brendan Harris and outfielder Jason Pridie. In return the Rays will receive short stop Jason Bartlett and relief pitcher Eduardo Morlan. The original deal was the same, except the Twins were sending Juan Rincon instead of Eduardo Morlan. But the Rays were discouraged with Rincon's arm injury, which resulted in the Twins sending Morlan in his place. Obviously, the original deal is more appealing from the Twins standpoint as Juan Rincon's numbers have dropped significantly over the last few seasons. But either way, the Twins didn't let a minor league pitcher stand in the way of acquiring a very good offensive talent in young, which gives me some optimism for this off-season with new GM Bill Smith, that's something that I don't see happening if Terry Ryan were still the GM. Delmon Young was drafted by the Tampa Bay Rays in 2003 with the first overall pick in the draft. After only a 3-year stay in the Rays minor leagues, Young finally made his major league appearance as a 20-year-old in 2006. Young was hit by a pitch in his first major league appearance. After striking out in his second at bat, he hit his first major league home run. There may have been some motivation to why Young was hit by a pitch in his first at bat. Earlier in the season, Young was involved in a situation in which after he was ejected in a AAA game, he tossed his bat at the home plate umpire which resulted in him receiving both a 50-game suspension and a bad reputation throughout baseball. And since being promoted to the majors, he hasn't really shined away from being "immature" after many disagreements with Rays management, which could be the reason why the Ray's dealt him. Regardless of the bad reputation, Twins fans should be ecstatic about the potential that Young brings to our lineup. His minor league numbers show that he is very capable of putting up insane numbers which could one day lead him to the hall of fame. As you can see, even with Young's "Demons" in his head, he still has a ton of upside and could give the Twins a reliable bat to place between Joe Mauer and Justin Morneau in the order for possibly the next decade or so. A little problem with this deal for the Twins is that it still doesn't give them a reliable player to put in center field to replace Torii Hunter, who signed a 5-year $90 million with the Los Angeles Angels last week. Young has experience of playing center field, but his lack of range and powerful throwing arm would probably best be served in left field or right field. And with Michael Cuddyer already in right, it looks like left is the most likable spot for him. As for the other players we received, Brendan Harris is a pretty good hitter who will probably serve as our second baseman to begin 2008. I'd say short stop, as that's what he's played most of, but the Twins like having a player with a lot of range at that position, and unfortunately Harris doesn't posses the range of a guy like Nick Punto or Alexi Casilla. In fact, his career zone rating of .755 at short stop is significantly lower than Punto's .850 ZR at short stop. If the Twins can acquire one more bat, I honestly wouldn't mind seeing Punto in the lineup as our shortstop. The 27-year-old Harris hit .286/.343/.434 with 12 home runs and 59 RBI's last season in 521 plate appearances for the Rays. Jason Pridie might be a player that some of you have heard of before. And you're probably correct. Pridie was selected by the Twins in the 2005 MLB Rule V draft. But after he didn't make the team out of Spring Training, he was returned to the Rays. In 2007, Pridie split time between AA and AAA. In AAA he 10 home runs with 39 RBI's in 245 plate appearances. As a 24-year-old outfielder, Pridie will probably serve as the teams 4th or 5th outfielder, if he makes the team out of ST. The move could mean the Twins will non-tender Craig Monroe which would make him a free agent. Matt Garza was sent packing after just 3 years in the Twins system. The Twins drafted him in the first round of the 2005 draft out of Fresno State. After pitching 108.1 innings for the Bulldogs in '05, he pitched an additional 75.2 with the Twins between Elizabethton and Beloit. After starting the 2006 season in Fort Myers, he quickly excelled through the Twins organization up to the Major Leagues. As a 23-year-old in 2007, Matt Garza frustratingly started the season in AAA Rochester. After a few months of whining and mediocre pitching, he finally made his way to the Twins rotation and actually proved to be a fairly good pitcher for the Twins down the stretch. He has a very good fastball, with a pretty good 12-6 curveball. His biggest flaws are that he too has had his moments of immaturity and he needs to really work on his off-speed poitches if he wants to develop into a potential #2 starter for the Rays. Bartlett had a rocky season for the Twins in '07 after he played a very important role in the Twins playoff-run in 2006. He hit .265/.339/.361 in 510 plate appearances. He also tied Ryan Braun for the most errors in the league with 26. He has very good range, but needs to work on routine plays and his accuracy with his throws. But I think that he'll be a fine addition to the Rays. Although, he will probably have to switch positions at some point as the Ray have top-prospect Reid Brignac most likely starting next season in AAA. So he should be arriving in Tampa at some point next season, which would most likely result in Bartlett moving to second base, as long as he has his defensive woos worked out. Morlan is probably the biggest problem with this deal for the Twins. At just 21-years-old, Morlan was on the fast track to potentially become an important player in the Twins bullpen around the time they open the new stadium. The Twins are now rumored to possibly be willing to trade closer Joe Nathan before next season, because he is set to become a free agent after the season. With this deal, the Twins dealt away one of the top relief pitchers in baseball and potentially their future closer. I don't want to whine about us trading a pitcher, because we've all been asking for it for a few years, but I just don't know how it could go from Juan Rincon to Eduardo Morlan. I'm just not sure how that worked out, unless the Rays thought that Rincon's value is higher than it actually is. We may never know. A) The Twins get a boat load from the Yankees including (possibly) Phil Hughes, Ian Kennedy, Melky Cabrera and one of Jose Tabata or Austin Jackson. It could also lower their stance of holding onto both Joba Chamberlain and Robinson Cano. B) The Twins get a boat load from the Red Sox (possibly) including Clay Buchholz, Jacoby Ellsbury and perhaps one of Jed Lowrie, Jon Lester or Manny Delcarmen. Of course, any of these are the high-end in terms of return, but I could see one of the teams driving the price up that high. Of course, the big question marks are still at center field and third base, but at least this deal gives the Twins at least one hole filled in either DH or CF. It'll just depend on where the Twins choose to play Young. And by the way, I don't feel Young will bat 6th for very long, I actually see him and Cuddyer switching. But I don't think anyone would be surprised to see Cuddyer start next season in cleanup. Tomorrow, I will further speculate the Joe Nathan and Johan Santana trade rumors. In a rumor that has been floated around for weeks, the Twins are now close to getting Delmon Young from the Tampa Bay Rays in exchange for Matt Garza in a 6-player deal that could be finalized as soon as today. La Velle E. Neall III broke the story and said that the Twins would also part with short stop Jason Bartlett and reliever Juan Rincon. 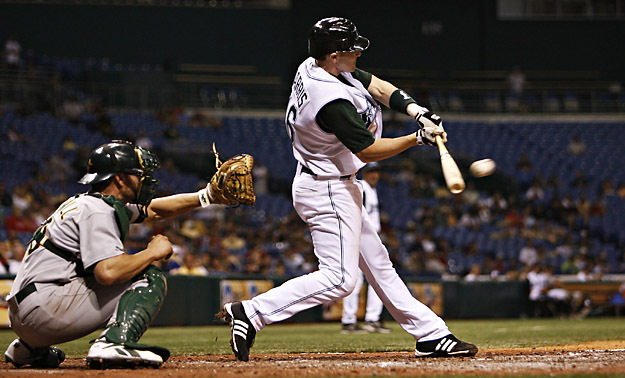 The Rays would also part with outfielder Jason Pridie and infielder Brandon Harris. It's not known if the Twins plan on playing Young in center or if they're still in the market to acquire a new center fielder, but this definitely gives the Twins a great right-handed bat to go between Joe Mauer & Justin Morneau for the future. This may have an affect on a trade regarding Johan Santana, but it's not known to what effect. I'm sure the Twins could have a close offer with a team that could bring back at least one ML-ready pitcher. I've seen a couple rumors about the Yankees offering both Phil Hughes and Ian Kennedy (along with prospect or two) for Santana. That would do it in my opinion. The Twins are rumored to be making him available via trade and would like to move him before the start of spring training. But doing so is not going to be the easiest thing. The Twins, and many other teams/officials feel that Johan Santana is the best pitcher in all of baseball and the Twins should receive a fair amount in return for him. The Twins are said to want one major league star, and an assortment of pretty good prospects. The teams that are likely to make a play for Santana are the Dodgers, Angels, Mariners, Mets, Yankees, and Red Sox. Here are a few deals from each team that I think would be an acceptable return for Santana. Mets trade: Carlos Gomez, Fernando Martinez, and Deolis Guerra. Notes: I touched on this potential trade last week. But just to reiterate, the Twins would be receiving two top outfield prospects in Martinez and Gomez and also a pitcher with a very high ceiling in Guerra. Gomez (21), Martinez (19) and Guerra (18) would give the Twins 3 very young players who could really make a difference as the team is opening the new stadium in 2010. Notes: I think that if the Twins really are intending on acquiring a "major league star" in return for Santana, then they can't get any better than Reyes. Reyes is extremely dangerous on the base paths and although his power declined in '07, he does have potential to hit about 25 home runs. Mulvey is a good pitching prospect who has good control of the strike-zone. This would be a good return for Santana as Reyes is signed for extremely low price until 2011 where he has an $11 million option, which is still very reasonable. Notes: The Yankees seem unwilling to include either Chamberlain or second baseman Robinson Cano in any deal for Santana, but I think those are the two players the Twins will most definitely covet. Cabrera would be a replacement for Torii Hunter, and Duncan once thought to be the Yankees long-term option at third base still has power numbers, but that's about it. I think he could benefit from a change of scenery. Notes: The Twins would be acquiring one of the best young pitchers in baseball with Hughes and two highly-thought after outfielders in Jackson and Tabata. Unfortunately, neither Jackson or Tabata will likely help in '08, but could be ready to be everyday players in '09. It's also reported that the Yankees would like to try and hold onto Jackson after a strong second half of the '07 season has made him a rising prospect. He was named the 49th top prospect in baseball by MiLB.com. Yesterday I talked about a deal very similar to this. Notes: The Twins would still be getting a top pitching prospect in Kennedy, and serviceable outfielder in Gardner who could probably start this season. But they'd also be getting a major league star in Cano. Cano has a great swing, like the Twins own Joe Mauer, and he also has good power potential that could reach over 25 per season. The biggest problem with this deal is that although the Twins want to have a left-handed dominate lineup they also need a few right-handers in there too and this would bring none. Mariners trade: Adam Jones, Matt Clement and Matt Tuiasosopo. Notes: This deal would give the Twins a potentially great centerfielder in Jones and a good candidate to be DH in Clement. Tuiasosopo isn't a great prospect, but he does have upside and is still very young. He'll likely be in AAA next season as a 22 year old and will have a couple years to prove imself there. Wladimir Balentien is another player I could see the Twins try to get in place of one above, but I doubt the Mariners give up both Jones and Balentien and I think any deal must include Jones. Notes: The Red Sox would like to keep Ellsbury and trade Crisp, but if they also want to keep Buckholz and don't want to end up trading 5 or maybe more other top prospects, then one of them has to go. Ellsbury is a very energetic player and has a lot of potential. Lester is a cancer survivor and would give the Twins a potentially very reliable arm. Middlebrooks was a top draft pick in '07 and will likely have to switch positions to short stop as third base is already occupied for at least the next few years. I'm not sure they'd want to trade him as they just drafted him, but it could happen if they are truly serious about trading for Santana. He'd likely be the Twins long-term project at third base if he were acquired. Notes: Like I mentioned, they'd probably rather trade Crisp, but in doing so, they'd have to give up Buchholz. Crisp is a pretty good replacement in center field as well, and many think he'll be gone regardless if it's in a Santana package or not. Lowrie is a high on base guy and is great at working pitchers to get a good at bat. He's a switch hitter and has probably the same defensive abilities as Jason Bartlett. (he could be good, but makes some costly mistakes with his arm at times and sometimes it seems like the ball is flubber). Buchholz is a potential ace that the Twins would receive as they lose their ace. That would give them Matt Garza, Francisco Liriano, Buchholz and some could argue Kevin Slowey as major league ready potential aces. Not bad considering all are in their low-mid 20's. Notes: The price is fairly steep, but the Angels as well as the Dodgers have the fire-power to put a deal out of reach. Adenhart is another potential ace that the Twins would acquire, but he's about a year away from being considered to start. Kendrick is one of the best young all-around hitters that I've seen. And Willits is a perfect lead-off candidate with a blistering OBP and the ability to steel a base at any time. Notes: The only think worth mentioning in this deal is that Brandon Wood has some serious power potential, but will need to work a lot on his defense if he wants to be an everyday player. He may be best suited (at least for right now) to be an option at DH. Notes: This deal would give the Twins two very high on-base guys in Figgins and Willits, a potential #4 starter in Green and a shortstop with some serious pop in Rodriguez. I'm not sure if many would want this eal as Figgins and Willits won't give us any power and Rodriguez and Green are still a year or two away from contributing. This I'm guessing won't be a very popular trade among most Twins fans. Notes: Many rumors surrounding these players have been popping up left and right. The Dodgers would like to keep Kershaw, unless they can acquire a dominate starter in return. LaRoche and Kemp would fill our holes at third base and center field. Kemp has the bat to be a .300 hitter with a fairly decent amount of power in his career. LaRoche looks like he could be a .275-.280 hitter with 30+ home run potential. Kershaw is another potential ace in return. Notes: James Loney is one of the better young players when it comes to best contact. He also has the frame to build up power potential and could be a dominate hitter some day. I like the numbers I've seen in DeWitt, especially coming from second base. If he could put up near 20 home runs each year with a respectable .275 average, I think he'd be worth a look. Elbert is a big question mark as he missed almost the entire season after having scar-removal surgery on his shoulder. Notes: Young is a good hitter with a small frame but can drive the ball over the fence. He was once a second baseman and now will likely find himself in the outfield. Miller was once a very feared prospect with a great 9.8 K/9 ratio. He has found himself in a rut the last year and a half or so, but is still only 23 years old and could be a potential steal in a deal with the Dodgers. Obviously, some of these are debatable. But I think that for the most part, the Twins have some very good options. The opening offers will probably not be this high, but I think that the deals could get bigger than we can even imagine if a few teams (especially rivals) get into the mix. And speaking of a potential Johan Santana trade, the most recent reports are that that Twins and Yankees are in "preliminary talks" about a trade to bring Johan Santana in the Bronx. It's not speculated on who is being discussed in a deal. On Sunday, the "reliable" Peter Gammons reported that the Twins are looking for a deal from the Yankees that would include pitcher Phil Hughes along with outfielders Melky Cabrera and Austin Jackson. My first thought as I'm sure many others is "that's it?" Don't get me wrong, Phil Hughes is a great young pitcher who could one day be a #1 starter on the Twins. But he's had some injury problems in his career that has given him the nickname "Prior-lite." In reference to the oft-injured Mark Prior. I think that Melky Cabrera is a fine young outfielder, but he's not going to make a big difference for the Twins as I think that Denard Span has about as much upside as he does (although some may not feel that way). Austin Jackson is a fairly good outfield prospect, but his "top prospect" status is inflated by having a very good half-season in Advanced-A ball this season. He probably won't be ready to make an impact until the Twins open the new stadium in 2010. So that gives the Twins one great young pitcher, a serviceable outfielder and a "B" prospect. I personally don't think that's such a bad thing when you look at it that way, but I really wish the Twins could find a better offensive bat in the deal other than Melky Cabrera. If the deal were Phil Hughes and say Robinson Cano, then I'd accept it. But I'm not sold on Melky Cabrera and quite frankly I'd rather try to get Reggie Willits from the Angels in exchange for a young pitching prospect instead. But if this deal does come true, it would only fill one void that the Twins would have, centerfield. The reason why I don't think that Hughes would fill a void is because I think that even without Santana, I think we're fine with pitching. Sure Hughes would make it better, but I think we could get by without him. Obviously, he'd give us a very promising rotation, but if you substituted Hughes with Kevin Slowey or Glen Perkins, I think it'd also be very promising as well. I think the Twins need to demand Cano in a deal with the Yankees. He's a proven .300 hitter and looks like he could develop with 25-30 home run potential. Cano would help strengthen our weak lineup, and although he's expressed no interest in doing so, he could some day be a candidate to move back to third base. He doesn't exactly fill a dire need, but he immensely improves a position that we don't really have a great player at. I don't really like either deal compared to the deals I think we could get from other teams, but I also think that it is a very low-ball type of offer and I really want to see the Twins get something more. Later this week, I'll give some "realistic" trade options for the Twins, as I've been pretty much doing all off-season long. According to Joe Christensen, Johan Santana has declined an offer of $93 million over 5 years to stay with the Twins. Rightfully so, the starter's agent countered with a deal similar to Barry Zito's 7-year $126 million deal that he signed with the Giants last winter. The Twins are unlikely to commit that kind of money over that length of time (about $18 million annually) so the Twins are now beginning to listen to trade talks involving the two-time American League Cy Young winner. I think that the Twins and Bill Smith need to start negotiating with him. The team offered a 3-year $45 million offer to Torii Hunter in August and have yet to offer him a counter offer. How about we sit down and see what Johan wants? Is that too hard to ask? If this is the approach that new GM Smith is going to take, then he's going to wear out his welcome very fast with both Twins fans and also the players/management. If they sit down, and still can't come to an agreement, which I'm suspecting that we can probably get him at about $17 million annually, then I say that we look into trading him. A deal that has been coming up in the rumor mill a lot lately is with the Mets, which would involve the Mets trading two of their three prized young outfielders and at least one of their young pitchers and possibly a mid-level prospect or young reserve as well in return for Santana. Martinez is a 19 year old outfielder from the Dominican Republic. At just 19, he could start the 2008 season in AAA after already playing 60 games and having 235+ at bats in AA. He's rated the Mets #1 prospect heading into 2008, according to baseballamerica.com. He has a great arm and is very fast and can cover a lot of field. He is a potential 5-tool player and in my mind, the centerpiece to the deal. There have been a few reports of the Twins interest in acquiring Gomez to take over center field with the departure of Hunter becoming all the more likely. At just 21, Gomez already made the jump to the Majors. He played in 58 games for the Mets this season and had 125 at bats. He's ready to be an every day starter in '08 and he too is a potential 5-tool player. There are some who think that with his speed and athleticism, he best resembles the Ray's Carl Crawford... only a right handed version. That is very promising for the Twins. I understand that many probably want someone who can step in right now, but in my opinion, with or without Santana or even Carlos Silva, the Twins have plenty of other options for 2008. Guerra is just 18 years old and is ready for AA next season. He had a great season in '07 as a 17/18 year old in the Florida State League, where he went 2-6 with a 4.04 ERA and 66 strikeouts, but the ceiling is very high on this guy. The Twins would be very smart getting this guy in AA at just 18/19 years old, since the Twins already have enough options at the Major League level. A few other players that could be possibilities (as substitions for a player already listed) are: Lastings Milledge (Outfielder), Mike Pelfrey (Pitcher), Phil Humber (Pitcher), Kevin Mulvey (Pitcher), John Maine (Pitcher). But as I mentioned before, I think that the Twins could possibly get a mid-level prospect or a reserve player in the deal as well. Hernandez is stuck behind Jose Reyes and Luis Castillo at both second base and shortstop, which means that the Mets could really consider a deal involving him. Hernandez had a successful '07 season in AAA but didn't get much time with the Mets (due to the players ahead of him). In his minor league numbers, he may provide a little bit of "pop", albeit not much (maybe 5-10 at a high). I think he could be a low-risk guy in return who could start over Nick Punto at second base. Gotay is definitely a better player than Herndanez, but he too is stuck behind both Reyes and Castillo in the middle of the infield. He will get on base more than Hernandez and will help produce runs more than Hernadez as well. Through 2200+ at bats in the minors, he is a .276/.356/.424 hitter. That is compared to Hernadez's .275/.318/.362 through 3000 MiLB at bats. I think the must-have player for the Twins is Fernando Martinez. He has an extremely high ceiling and is extremely young for his level. If we can get him along with either Gomez or Milledge and one of the pitchers I listed, I would be very happy. Gotay or Hernandez would be nice too, but I could live without them. Lastings Milledge, Carlos Gomez, Mike Pelfrey and Phil Humber. This deal isn't bad either, but I think that the Mets will do anything they can to keep Hernandez, including offering another pitcher in return. This deal would give the Twins two ML ready outfielders, as well as two ML ready pitchers. I don't particularly like that deal, but I too could live with it. The Mets also have enough pitchers that could replace the loss of Pelfrey & Humber. What do you think? Should the Twins just stick with Johan and look to either deal him later, let him walk or try and sign him? And as I'm about to submit the post, I found out that Torii Hunter has agreed to a 5-year $90 million deal with the Los Angeles Angels. I don't have a ton of reaction to this right now, but I will try to express my thoughts later. Have a great Thanksgiving and a fantastic weekend! • Update: According to the Chicago Sun Times, the Chicago White Sox and Torii Hunter are said to be working on a contract and the deal could be done "within the week." Well there ya have it folks. I have to say that I'm relieved that it looks like the "Hunter saga" looks to be coming to an end, but at the same time I do wish that we could find a way to keep him. Although I'm now sure that the Twins will find a way to keep Johan Santana and Joe Nathan since they won't have to worry about re-signing Hunter. • Over the weekend, Sid Hartman announced that "word in baseball circles" that the Twins have offered a five-year $93 Million extension to Johan Santana. La Velle E. Neal III said that it's not known if this is true or not, but if the Twins did infact offer him that, I would be surprised if he accepted it. He could get twice that amount (obviously over more years) if he just waits and lets teams bid on him next winter. • Former Twin Luis Castillo just going to stay with the Mets after netting a four-year $25 million deal to stay in Queens. Remember the Twins traded him in July because of him likely wanting a deal like this, although it is evident that he has definitely lost a couple steps in his game. At an average of $6.25 million per season, I'm pretty happy with the teams choice of trading him, even though we didn't get a significant prospect in return, although Dustin Martin does look to have a little promise. • Head over to Seth Speaks to see what Seth had to say about the Vikings win, and also his thoughts on Mariano Rivera's new three-year $45 million deal with the Yankees, and what that means for the Twins chances of re-signing Joe Nathan. • Torii Hunter reportedly had dinner with Rangers owner, Tom Hicks at his house last night. Also to join them were manager Ron Washington, pitcher Kevin Millwood, and Hunter's agent Larry Reynolds. I've thought for a while that Hunter would likely land with the Rangers, and now it looks like their ready to throw out everything they have to land him. Hunter has also named the Los Angeles Dodgers as "near the top" for a possible destination. Who else would you like to add to that list Torii? You've already listed the Nationals, Braves, White Sox, Royals, Rangers, and now the Dodgers. What about the Rays? What about the Giants? You're forgetting a few. Update: This doesn't look like it will have a large effect on anything now that he's likely to play for the White Sox. • Matthew Pouliot wrote an article at Rotoworld about who he thinks are this off-season's trade candidates and what he sees as being the likeliest of offers for the player and where he sees them ending up. Of course, Johan Santana's name was on the list and he predicts that Santana will end up staying, for now, but may be gone come July. Make sure to check out his offers. I think they're a little on the low side, but that's probably because of my bias that I think Santana's worth more. • Aaron Gleeman has another entry to his "Top 40 Minnesota Twins". Check out who #17 is and make sure to go back and find out who he ranked between #18-40. • The New York Daily News speculated that the Yankees (as I'm sure many teams are) hoping that the Twins will make Johan Santana available via trade during the Winter Meetings. There have also been reports that the Yankees would likely offer either Joba Chamberlian or Phil Hughes as well as either Robinson Cano or Melky Cabrera. Ummm... if I were Bill Smith, I would also demand that Jose Tabata was involved as well, and I'd probably still want more. Hughes and Cabrera is a ridiculous offer. Hughes aka "Mark Prior-Lite" is a big risk. He has the numbers to make him look like a potential stud, and although he's young, he needs to really gain strength and he needs to have better conditioning to help him not become injured like he has during his career. I personally think that a good deal would be Chamberlain, Cano, and Tabata. And if we got Cabrera instead of Cano, I would also demand Ian Kennedy as well. • Over the weekend, the Twins finally let go of Chris Heintz. Heintz has been on the Twins 40-man roster for the last three seasons and the emergence of Jose Morales made Heintz the odd-man out. • The Twins also announced the plans for TwinsFest 2008. It will take place January 25-27 at the Metrodome. Over 50 Twins players (future, current and former) will be on hand to sign autographs. There will also be a 5-foot by 5-foot model of the new Twins stadium. • Who says there's no such thing as a hometown discount? Tom Glavine turned down a $13 million option to remain with the Mets, to go back to the Braves where he spent 15 of his 20 seasons in Atlanta. His new deal is reportedly worth $8 million. Glavine won two NL Cy Young's with the Braves. If only Torii Hunter could take a look at Tom Glavine and learn a thing or two. • Yesterday afternoon, the Chicago White Sox traded pitcher Jon Garland to the Los Angeles Angels for short stop Orlando Cabrera. I can understand the deal for both sides, but I am also critical of the deal for both sides. The Sox need a short stop who can get on base a lot, Cabrera does that. The Angels want to sure-up the bottom of their rotation, Garland does that. But the Sox are now in a pickle with a pretty weak rotation and the Angels will need to decide who they want to play short stop. Brandon Wood has atrocious defense and would be a liability. Chone Figgins could, Maicer Izturis could, Erick Aybar could, and Sean Rodriguez could as well. But none of them (with exception to Figgins and Wood) are as good of hitters as Cabrera and none of them will come close to him as a defender. The Angels also have Figgins "penciled" in at third to start next season, but Wood may be at the hot corner with Figgins moving to short, which wouldn't be a horrible deal. The Angels are also rumored to be in the running for Miguel Cabrera, which could change things a little bit. • Buster Olney redeemed himself yesterday morning. He reported on his blog that the Red Sox and third baseman Mike Lowell were close to signing a contract extension, and it later turned out to be true. I was a little hesitant of the report after Olney gave us his best Peter Gammons impression and said that the Twins and Cardinals were talking about a Scott Rolen trade. Which Joe Christensen quickly shot down. I like him as a reporter so I'm happy he washed away any questions I had of him. He, Jayson Stark, and Tim Kurkjian are probably my favorite baseball guys on ESPN. I also think that Carl Ravich does a good job of hosting Baseball Tonight. • On Sunday, Jimmy Johnson won his second consecutive Nextel Cup championship. He did so in a nice fasion, winning 4 of the last 5 races. Although that is a great feat, I am not going to say that I think of him as the champion. This season was clearly won by Jeff Gordon, and if it wasn't for the ridiculous "chase for the cup" then Gordon would've been named the champ a few weeks ago (and probably would've won by 300 points, regardless if Johnson won these races). I like Johnson (he's probably my favorite driver), but I can't say that see this as being fair. Over the weekend, La Velle E. Neal III confirmed that the Twins were interested in bringing in switch-hitting first baseman Tony Clark. Clark has spent the past 3 seasons with the Arizona Diamondbacks where he hit 53 home runs in 702 at bats (one every 13.3 at bats). His 53 home runs isn't bad, neither is his slugging percentages of .546 over the last 3 seasons. The big problem with Clark is his .266 average and fairly low on base percentage that raises concern. At 35 years old, he is likely to only be seeking a one or two year deal with a salary of somewhere between $1-2 Million annually. He will likely only be candidate to fill in at designated hitter. Historically speaking, this is a Twins-like signing (older vet, cheaper salary, dwindling career), but I'm hoping that new GM Bill Smith is just bluffing and doesn't actually find Clark to be a possible signing. I will say that I think that Clark is a better DH option, than what we have, but with Craig Monroe already penciled in as the backup left fielder and designated hitter, I don't think that Clark is really needed. If we didn't just trade for Monroe, I wouldn't be skeptical of this deal, but with Monroe and Clark possibly making the lineup for the Twins, I will not be very thrilled. Clark has a good deal of power still, which is very nice, but I just don't want to have both Monroe and Clark. One is fine, but not both. I guess we'll have to wait and see if this plays out, but I'm hoping that (for Jason Kubel's sake) this isn't true. On Saturday, the Phoenix Desert Dogs finished up with a 20-11 season and wound up winning their 4th straight AFL Title in a row. 7 members of the Twins farm system played big roles for the Desert Dogs. Macri finished up the season batting .257/.315/.406 in 101 at bats in 28 games. He also had 9 doubles and 2 home runs. Macri was sent down there to help the Twins get a better look at his bat, which they acquired in a trade with the Colorado Rockies for Ramon Ortiz in August. This probably doesn't give the Twins of hope, but he'll likely be back in Rochester to begin '08. Plouffe had a resurrected '07 season and he continued his strong play in the AFL. He finished up the AFL season batting .280/.379/.360 with just 4 doubles in 15 games (50 at bats). He is still very young, and is definitely at least 2 years away from making any sort of impact on the Twins, but his strong 2007 definitely gives the Twins optimism of his upside, after it seemed to be dwindling. He should start '08 in Rochester, but due to his age and the fact that Rochester's infield may be crowded, he may be forced to earn his way up from New Britain. Butera was also sent to the AFL to give the Twins more of a look at a newly acquired player. Butera was acquired from the Mets along with Dustin Martin for Luis Castillo in July. Butera batted .250/.314/.313 in 12 games (32 at bats) in the AFL. Because of the lack of depth in the Twins system at catcher, he will probably start '08 in Rochester, but probably should stay at New Britain. Swarzak was sent to the AFL probably because he had a short season due to a 50-game suspension in the beginning of the season. Well he and the rest of the Twins young pitchers came ready to throw this Fall and really impressed many. Swarzak was 1-1 with a 2.05 ERA in 7 starts (22 innings). He had an "ok" 3-1 strikeout to walk ratio, and a respectable .241 average against. He will probably start '08 in Rochester, and if he can put together a strong next season, he could be pitching for the Twins come September. Mullins had a strong fall with a 1-0 record and 2.84 ERA and 20 strikeouts in 6 games (5 starts...19 innings). He had somewhat of a successful and somewhat of a frustrating season in '07. He was dominant in High-A Ft. Myers and was strong in AA New Britain, but he really struggled in AAA Rochester, which lead to him finishing the season back in New Britain. He will probably be in Rochester to start the season, but could be back in New Britain if he doesn't show improvement. Morlan had both a good regular season and also a good fall season. He finished up the AFL with 1 save in 12.2 innings and also a win and 7 strikeouts while holding his opponents to a very good .190 average. He will more than likely start '08 in New Britain as he only has 4 innings of experience there, and he and Rob Delaney will be a very tough 1-2 punch late in the games as they were in '07. Blackburn had a great fall league winning 4 of his 6 starts and compilling a 1.64 ERA and a ridiculous 10/1 K/BB ratio in 22 innings. He definitely gave the Twins optimism after he floundered late in the season while he was with the Twins. The team will more than likely keep him on the 40-man roster this season and he will probably be a dark-horse candidate to win a spot in the rotation. If he doesn't win a spot in the rotation, the Twins may opt to keep him in the bullpen or they may send him down to Rochester to begin the season. But as a 26 year old next season, it is definitely a potential "make-or-break" year for him with the Twins. Brian Duensing helped Team USA beat Cuba to win gold at the IBAF World Cup. The 24-year-old southpaw, pitched 4.2 innings and gave up 2 runs before being pulled. With reports of Alex Rodriguez on the verge of signing a 10-year $280 Million contract with the Yankees, it looks like teams may put all their focus on trying to acquire Johan Santana or Miguel Cabrera. According to the Palm Beach Post, the Los Angeles Angels and Los Angeles Dodgers are the "frontrunner's" in acquiring Miguel Cabrera. Cabrera a 24-year-old third baseman is likely to be traded because of his potential salary that should reach upwards of $20 Million annually after he is through with arbitration. Cabrera is good, but how good is he? Well according to the report, the Dodgers would have to part with four of the following to acquire Cabrera: Matt Kemp, Andy LaRoche, Chad Billingsley, James Loney, and Clayton Kershaw. Where the Angels would have to part with: Howie Kendrick, Nick Adenhart, an Outfielder, and a Pitcher. The pitcher could be Ervin Santana while the outfielder could be Reggie Willits. That is a hefty ransom for the blimping (is that a word?) Cabrera. It raises the question, if the Marlins could get that for Cabrera, what could the Twins get for Santana? Well it's hard to compare a pitcher to a position player, except when the pitcher has won 2 Cy Young's in the last 4 years, and is the best pitcher in all of baseball. Cabrera is good, but he is not the best at even his own position. To my thinking, if the Marlins can get that from the Dodgers, the Twins shouldn't have a problem getting that from the Dodgers. But that is also debatable due to Cabrera's age compared to Santana's (24 to 28) and the teams need for a third baseman compared to a pitcher. Many feel the Angels only weakness was that they needed a power-hitting third baseman. The team has extremely good pitching and so the need for Santana isn't as imperative as the need for Cabrera. The Dodgers had a pretty good rotation last season, and their Achilles Heal was the absence of a power hitter. Jeff Kent lead the team with 20 home runs, although his future with the club and with baseball isn't exactly clear right now, so the team desperately needs to find a fix. So they too probably have a higher fancy for Cabrera. That would also cost very little against our payroll which could allow us to (A) find a different second baseman or (B) find another starter. That could mean bringing back a guy like Luis Castillo, or bringing in a new guy like Kaz Matsui at second. Or we could bring in Kenny Rogers or re-signing pitcher Carlos Silva. Yesterday afternoon, the Twins acquired outfielder Craig Monroe from the Chicago Cubs for the infamous Player-To-Be-Named-Later. Monroe is a career .256 hitter with a .749 OPS. He is coming off of his worst season so far where he hit .219 with 12 home runs in 122 games split between the Chicago Cubs and Detroit Tigers. He has hit well against the Twins and at the Metrodome. Obviously, the Twins are hoping that he can duplicate numbers similar to these and hopefully he can prove to be a good pick-up for the offensively weak Twins. The move is a bit of a head-scratcher, though. The Cubs were most likely to non-tender him, which would make him a free agent. But since he was traded, the Twins will need to now offer him arbitration where he could make upwards of $5 Million. But if he were on the open-market, he likely wouldn't get that in a multi-year deal. Another big concern is who will the PTBNL be? Last time we traded with the Cubs, we ended up trading promising young Adam Harben for Phil Nevin who only had a handful of AB's in a Twins uniform. Of course hindsight is 20/20 and Harben later needed Tommy John Surgery, but I am just hoping we don't end up sending a guy like Zach Ward or Kyle Waldrop in return (since it will probably be a pitcher). Hopefully it's a low-level reliever with little upside, such as Adam Hawes. The next question is where does he play? He'll likely platoon in left-field and designated hitter with Jason Kubel. Monroe is better vs. lefty's and Kubel is better vs. righties. Although I think that most Twins fans would prefer to just see Kubel everyday instead of seeing him strictly vs. righties. Joe Christensen also notes that Monroe and Torii Hunter are very close friends and even work out together in the off-season, which probably won't play a big role in the hope of re-signing Hunter, although it is interesting. If only we would've traded for Frenchy instead... Perhaps that would've made a bigger difference? We may never know. "I'll definitely be tugging at him to stay," Monroe said. "Something I've always wanted to do is play alongside him. Playing next to each other, I think I can help him out a little bit." I think that it's a little encouraging to "Torii lovers", but I don't think it will be that big of a difference. According to Hank Steinbrenner, Twins GM Bill Smith and Yankees GM Brian Cashman have recently had a conversation in regards of a possible trade involving Johan Santana. "I think they're going to want a lot if they're going to trade him," Steinbrenner said. "Brian talked to their GM. He was just probing. They're trying to sign him. I don't blame them." Alright, well Robinson Cano and Jose Tabata is a start. Now lets add one of the "Big Three" in Joba Chamberlain, Phil Hughes and Ian Kennedy and you've got yourself a deal! Although I don't see the Yankees parting with that much to get him, when they probably have th best chance of signing him in free agency next fall. It would be interesting to see what the Yankees would be willing to part with to acquire Johan. I'm thinking Cano and one of the pitchers (preferably Chamberlain) would be the high-end of any deal. But I do think that the Twins must insist on Cano being apart of any deal. The AL Cy Young winner was announced yesterday and to a little surprise, the most deserving of the pitchers won the award. The only reason I say that is because it was speculated that Josh Beckett of the Red Sox was the front-runner to win the award over C.C. Sabathia of the Indians. As good as Beckett was this season, Sabathia was still better. I was most surprised with the number of first-place votes that Sabathia received compared to Beckett. Sabathia received 19 of the 28 first-place votes. Beckett received only 8 and John Lackey received the other first-place vote. Also receiving a vote was Twins-ace Johan Santana. I am surprised that J.J. Putz didn't receive a single vote, after having a fantastic season where he allowed just 11 runs in almost 72 innings and struck out 82 while picking up a league-leading 40 saves. I thought that he would've received at least 1 vote. Oh well. Sabathia and Beckett's stats were very similar, and the only thing that really separated the two was the fact that Sabtathia pitched over 40 more innings. Although some may not think that's a big deal, but it really is. It shows that he stayed healthy the entire season and went longer into the games. I think that durability is overlooked too much in a sport with a 162-game season. On somewhat of a side-note, I voted for C.C. Sabtahia for my "End of the Season Award Winners." I can also safely say that I'll probably be right on Alex Rodriguez as well. I'm not sure if "Tuesday Tidbits" will be a regular thing here this off-season, but it seemed fitting for today since I can't find anything substantial to dwell on. • The Rookie of the Year awards were given out yesterday, and as expected Dustin Pedroia beat out Delmon Young for the AL. And the closer vote came between Ryan Braun and Troy Tulowitzki in the NL. Both Braun and Tulowitzki made big contributions to their teams, although many could argue that Bruan's contributions were much larger than Tulo's. The argument could be made the other way as well. I personally voted for Young to win it in the AL, and Tulowitzki in the NL, but I'm not at all surprised to see neither of them win it. I still support my answers 100%, but I do understand why someone would vote otherwise. My Predictions for the American League and for the National League. • Division Rivals, the Detroit Tigers acquired one of my favorite former-Twins on Monday when they dealt utilityman Omar Infante to the Cubs for Jacque Jones. Jones signed with the Cubs after the '05 season and has been platooning in a crowded Chicago outfield since. He got his fair share of work though, and I have to say that he looked a bit better in Chicago then he ever did with the Twins. I am not going to enjoy seeing him in a Tiger's uniform from the standpoint that he's still one of my favorite players, but since I'm a fan of the Twins, I can't wait to see him strikeout 3-4 times a game when he faces Johan Santana and Francisco Liriano. • Speaking of Johan Santana, go over to Seth Speaks to see some of his proposed trades for Johan Santana in his "What Would it Take?" piece. It's very interesting and a great post. • The Kansas City Star is reporting that the Royals are interested in former Twin, Torii Hunter. The Royals along with the White Sox are both division rivals with the Twins that are interested in acquiring Hunter to man center field. Hunter had a meeting with White Sox GM Kenny Willliams on Sunday night. Reports are that the two of them talked about both the present and the future of the ball club. Twins new GM Bill Smith has hinted that the team is still interested in signing both Hunter and Silva, although it seems unlikely at this point. • Make sure to check out Twins-Territory to see their latest "Twins Tube Tuesday". It's nice to see such a great event for some from the hometown players. • Go over to Taylor's Twins Talk to see his latest version of the Top 25 College Football Rankings. I agree with LSU at #1 and Oregon at #2, but I think that Kansas should be #3 instead of Oklahoma just because they haven't lost a game and are in the same conference. Other than that though, I agree with most of his picks. • Bad news for Vikings fans, it looks like Adrian Peterson will miss some time with a torn lateral collateral ligament. It'll keep him out at least one game, but it will likely be a few weeks before he returns. All I have to say, is that the only hope for the Vikings having a miraculous turn-around is now over. I look forward to seeing what happens in the off-season. I'm hopeful that the Vikes can find a way to acquire Donovan McNabb (short of dealing a 1st or 2nd round draft pick). Oh the pain of being a Vikings fan.... For more on the Peterson injury, go over to Seth Speaks. The off-season's Hot Stove is here, and it will not disappoint. As the general managers leave Florida after spending this week talking amongst each other about different issued in baseball, there is talk that teams were rumored to be talking to other teams about potential trades. There rarely is ever a trade that happens during these meetings, but the Houston Astro's and Philadelphia Phillies did work out a trade that sent closer Brad Lidge to "The City of Brotherly Love" in exchange for speedy outfielder Michael Born who highlight the 5 player deal. The Twins were also rumored to be discussing a few trades over the break. A couple which I covered on Wednesday, and now there are a few other's that I feel are worth mentioning. I know another media outlet has reported that the Twins and Cardinals are discussing a deal that would bring Scott Rolen to the Twins, but I just spoke with two Twins officials who said they have had no discussions about Rolen whatsoever. That's not to say that Olney is right over Christensen, or visa versa, but I have to trust Joe Christensen first and foremost since he's been very trustworthy this season and since he covers the Minnesota Twins. Sometimes a reporter will talk to a representative of their team and it still is wrong, but I'm not saying either are right on this one. The deal makes sense because Rolen would like to be traded out of St. Louis because of his relationship with management and the Twins need a third baseman. Rolen, 32 is a career .282 hitter with a .878 OPS and has been a reliable run producer in his career, although he mostly known for his extremely good defense, which is backed up with 7 gold gloves. Rolen in my mind is a good fit for the Twins. I feel the organization is pretty confident in Danny Valencia's future and I think that Rolen would be a good fill-in for a year or two before Valencia is ready. But Rolen's due $36 Million over the next 3 seasons and is currently rehabbing from shoulder surgery that he underwent in September. He's had a lot of injuries in his career, so the Metrodome probably isn't the best place for him. It will be interesting if anything comes about from this rumor. Another rumor which I find very interesting is that the Twins and Tampa Bay Rays are in talks about a deal of some sort. It's rumored to be a deal involving outfielder Delmon Young of the Rays and pitcher Matt Garza of the Twins. There's nothing certain about this rumor, but it's believed that we could see a deal surrounded around those two players. It's just not sure if it would be a straight up trade, or if other players are involved. It's known that the Rays have a pluthera of young hitters, particularly outfielders and the Twins have a pluthera of young pitchers. Delmon Young is a 22 year old outfielder who has the potential to be the most feared hitter in all of baseball. He was the first overall pick of the 2003 draft and went straight to Low-A ball. He later skipped AAA, but it doesn't look like it's effecting him at all anyways. In his 3-year minor league career, he batted .317/.363/.517 with 149 extra base hits (59 home runs) and 272 RBI's. Unfortunately, he's probably most well known for this unfortunate incident which involved Young throwing a bat and striking an umpire, which resulted in a 50-game suspension. He's clashed a few times with Ray's management, including a blowup with manager Joe Maddon at the end of the season. Maddon pulled Young for not giving full effort on an infield grounder. They patched things up, but it's still known that Young isn't happy playing in Tampa. The biggest part of Young's stats in '07 weren't his 64 extra base hits (13 home runs), nor his 93 runs batted in or his .288 average in his rookie season. It's the fact that he played in all 162 games in the season. That number is huge for the Twins who have been hit by the injury bug a lot the last few years. If Young can play 162 times next season, or even 150, I think that he will put up big numbers for the Twins in his 2nd full year in the majors. 23 year old Matt Garza also flew through the Twins minor leagues in just a little over a year. He was the 25th overall pick in the 2005 draft for the Twins. He was a college pitcher (Fresno State) which made his transition a little easier, although it was still very impressive to see him dominate each level like he did. After starting the 2007 season in AAA Rochester, Garza was frustrated with the decision and he let his emotions get the best of him. He quickly matured and finally got the call a couple months later. He showed promise this season that some day he could be a potential ace, but he still has a lot to learn. But the potential is good enough for the Rays to be interested. The Rays who have a fairly weak rotation right now, could have one of the best young rotations in the next few years if they acquired Garza. First overall pick, David Price is the next potential flame thrower of MLB and should progress quickly through the Rays farm system. Garza teamed with southpaws Price and Scott Kazmir would give them a very strong 1-2-3 spot in the rotation. The deal in my mind would mostly benefit the Twins who would essentially be trading a pitcher who does have a lot of talent, but the Twins have a lot of young pitchers with great deals of potential. They'd be filling a spot in the lineup that is a need (center field... if Torii Hunter leaves) and would be acquiring a very good young right-handed bat. They'd also be doing so with spending no money that could be used to sign a free agent or resign a current Twin. Even if the Twins did resign Torii Hunter, that wouldn't be a bad thing either. It could push Young to #2 in the order or just make the bottom of our order much more improved, it would also give the Twins 3 of the strongest arms in the league roaming the outfield at the Dome. I don't think a single team would feel comfortable running on our very own "Murderer's Row." With Hunter, the Twins would be able to move Jason Kubel to DH, which would take care of another hole for the team, leaving just 3rd base as the only question mark. Joe Christensen also notes that the Twins are also interested in Tampa Bay infielder/outfielder B.J. Upton, Padre's third baseman Chase Headley, and Mets outfielder Carlos Gomez. Upton started his career at short stop, he moved to third base, he started this season at second base and finally ended as the starting center fielder. He is likely going to stay in the outfield, wherever he goes, but he too has a lot of potential in this league. He is just 23 years old and had a very impressive '07 campaign where he hit .300/.386/.508 with 24 home runs, 25 doubles, 82 RBI and 22 stolen bases. Headley is a 23 year old third baseman who is one of baseball's best 3rd base prospects. He hit .330/.437/.580 with 58 XB hits (20 home runs) and 78 RBI's at AA. He could be a potential all-star or he could be a potential bust. His numbers are impressive, but I would prefer to trade for more of a proven player. Gomez is just 21 years old (soon to be 22) and could be ready for the majors next season. He played 58 games with the Mets, although his stats weren't overly impressive, he showed promise that he could develop into a very promising outfielder. He will be a dangerous player on the basepaths, but his sub-.400 SLG% isn't promising for the power-less Twins. The Twins definitely have options, and it's nice to see new General Manager Bill Smith taking a very aggressive approach so far this off-season. But I'm not going to get my hopes up on any of this ever coming though. Although it is fun to speculate! Well, the Vikings currently are at 3-5 and will face the Green Bay Packers at Lambeau Field on Sunday. The Packers are leading the division with a 7-1 record and are being lead by great play from Brett Favre. I personally don't think the Vikings have a chance in this division, just because the Detroit Lions and Packers are both too far ahead for the Vikings to make a turn-around. And both have looked very strong this season. But of course, with a phenomenal running back like Adrian Peterson, anything is possible. Tavaris Jackson was supposed to be brought in here to take over QB after Brad Johnson left. Well that came a lot sooner than expected and he was forced to jump into NFL action prematurely. He's got a great arm, but lacks awareness and I just don't think that the West Coast Offense is the best offensive scheme for a young quarterback like Jackson. I understand why Head Coach Brad Childress drafted him, he ran the same style offense when he was the offensive coordinator with the Eagles and Donovan McNabb. McNabb and Jackson are essentially the same style of athlete and quarterback. I really want to be optimistic about Jackson and hope he turns it round, but I just don't see it happening. It's not all his fault, he doesn't have a go-to wide receiver he's been able to rely on, but at this point, I don't think it'd matter all that much. So with that said, I really think the Vikings will push hard for McNabb this summer either via trade or via free agency (if he's released by the Eagles). McNabb and Childress still to this day have a great relationship and I think that McNabb would be a good teacher for Jackson. If we don't go after him, I see us drafting a quarterback in either the first round or second round. Who could be there? Well in the first round, Matt Ryan is surely moving up the boards. I've liked Matt Ryan for a year or so, basically just because I've liked B.C. since William Green was running on opponents a few years ago, but I think that he's a good quarterback prospect. He poses a strong arm with great accuracy. He also has good vision on the field with his 6-foot-5 frame. I would have to rate him #1 right now. #2 would be Brian Brohm. I don't get the "product of the system" tag many put on him. Louisville has run the ball as well as they've passed the ball the last few years (remember Michael Bush?). It's not Brohm's fault that he makes that offense what it is. I personally hope the Vikings end up with Brohm over Ryan, but I have to still put him behind Ryan at this point. The Vikings biggest problem with drafting Brohm will be to get him before Atlanta gets him. Bobby Petrino was Brohm's coach at Loiuisiville and now coaches the Falcons. And with Michael Vick likely out for next season (if the Falcons would even consider bringing him back) I think the Falcons will push hard for Brohm. Next I want to put Dennis Dixon at #3, and although I like the ball he throws, I think he's a better athlete than quarterback and I can see him moving to wide receiver at the NFL level. Of course a team will probably try him at QB, but his run-first mentality probably won't equate to much at the next level as it's few and far between. So #3, I would put Andrea Woodson of Kentucky. You can argue that he's in the same field as Dixon with athleticisim, but I think Woodoson is more of a natural quarterback, and not a running back/wide receiver playing QB which I see in Dixon. I would be happy with any of them, but I prefer Brohm the most. Rookie Adrian Peterson is having a year for the ages. Not only is he a possibility for the NFL Rookie of the Year award, he could also make a run for the most yards in a season by a running back, and he could also battle Tom Brady for MVP, but only if Brady makes a big drop off from now through the end of the season. I've watched Peterson very closely since his freshman year, and he is honestly the reason why I started watching college football in the first place. Before him, I would only watch the Championship game and the Heisman Ceremony. So was I happy the Vikings drafted him? Of course. But to be honest, when I was looking at mock drafts before the draft, I didn't want us to draft him. It wasn't at all because of his injuries, it was because I liked Peterson so much that I felt bad he was going to end up on a bad team, like the Vikings. But I guess that if he didn't fall to us, he'd fall to another bad team regardless, so it kind of works out that the Vikings got him after all. If the offense could ever learn to throw the ball, we are going to have a phenomenal offense since Peterson is arguably the best runner in all of football. Although I still think LaDainian Tomlinson is a more complete back, I think Peterson's pass catching skills are underrated. Peterson's made a few mental mistakes here and there, but he's a rookie and he'll get over them. I hope that the Vikings trade Chester Taylor in the off-season. It's not because I don't like him, but it's because I think we could get a good return for him and I think we could find another suitable backup to Peterson. I think a 3rd-round pick wouldn't be out of line at all (it's also give the Vikings three 3rd-round picks which we could possibly package in a trade). I honestly like the direction that our receiving core is heading. The arrival of Sidney Rice is great, but it doesn't help him or anyone else when nobody can throw them the ball. Troy Williamson in my opinion is not the right fit for this offense. I think he'd be better in an offense like the Colts, who throw it more down field. I know people will say "well he can't catch the ball" and my argument is that almost every ball is over thrown or under thrown to him. In the Bears game earlier this season, he and Jackson connected on a 60-yard touchdown which was a rare "perfect throw" to him. And the Vikings only attempt to throw it down field ends up with the receiver running a straight route down the sideline allowing the opposing defensive backs to use the sideline as a second defender. I blame Childress for that. I'm also critical of his crossing routes, because they rarely ever end up in a big gain, and our receivers are burners who can make a cut and take it to the house at any time. The crossing routes we run don't allow us to do that. Personally I just blame Childress for all of our problems here. We also need to get Visanthe Shiancoe more involved in the offense. I know they've increased his role a bit the past few weeks, but he's an important player in this offense and he could help turn this team around (not kidding). It's not so much he can help turn this around, but any consistant receiver (mostly at tight end) could help turn this team around. I will reiterate what most already have stated. Bryant McKinnie is vastly overrated and overpaid. He has been very inconsistant for our o-line this season and he has let the defense put too much unneeded pressure on our quarterback. But I'm not going to go on and say that he's the problem why our quarterbacks haven't produced. But he isn't helping either. I really like the Steve Hutchinson-Matt Birk combo we have on the left-center of our line. They are very agile for big men and have helped Adrian Peterson break free. Peterson's success can be looked closely at what these two guys have done for him. I think the right side of our line needs help, and I hope we address it in the off-season either through the draft or free agency. I will also like to add, that I don't think McKinnie is a horrible left tackle. But I think that the "zone blocking" scheme that Childress runs is not his forte. McKinnie could really benefit with a change of scenery, or a different blocking scheme. This probably our most "sound" and consistent group on the team. The D-Line is anchored by the Kevin Williams and Pat Williams in the middle. With Ray Edwards and Kenechi Udeze on the outside. Edwards has looked promising at times, and he's also looked lost at times. Luckily for him, Brian Robison has been very impressive in just his first year and has helped him out, however he may be cast aside to let Robison start at some point this season. Udeze is also having an impressive season. After not sacking a single quarterback in 2006, he has 4 so far this season. Although I'm not sure it will be enough to secure his starting job in 2008. Erasmus James still hasn't made an impact since he's come back with a knee injury. He's under contract with the Vikings until 2012, so he'll have time to prove he's worthy, but he needs to get healthy and stay healthy to get the chance. I personally like our linebackers, but they can make me very frustrated at times with inconsistent play, primarily in coverage. Ben Leber is a very good defender, but he's been burned a few times this season, as has Chad Greenway and E.J. Henderson. I like Henderson up the middle, where he's been very effective this season, and I like Greenway's athleticism, so I'm still very optimistic about this group. A group I'm far less optimistic about is our defensive backs. Coming into this season, we had a very good backfield with Antoine Winfield and Darren Sharper as the main components, but they as well as everyone else has looked dreadful this season. Promising young corner back Cedric Griffin has been very hard to watch at times as he still has been making rookie mistakes, yet it is his second year. I would not be surprised to see a huge overhaul to our backfield this off season with Sharper possibly being cut and Winfield can't feel safe either. I think Winfield is one of the best corners in football, but I think his disagreements with Childress will possibly push him out of Minnesota. Next season, I will be very uncomfortable if Griffin and rookie Marcus McCauley are our starters. Dwight Smith will likely be gone as well, which means we could potentially have 3 holes that need to be filled. If we keep Winfield, I wouldn't be surprised to see Griffin moved to safety to fill a hole, where I think he'd be better at anyways. If that became reality, a big name free agent would be nice to help out the weakest part of our defense. Ryan Longwell and Chris Kluwe have been very good for us this season. I don't have much to say about them, except that I'm happy we inked Kluwe to a long-term deal and that I'm happy Longwell is a Viking. But for returning. I think that it's ridiculous to have Adrian Peterson out there returning kicks, unless it's a dyer situation. I understand that he'd be a big risk if we're under pressure and he doesn't have experience (look at his rookie mistake against the Eagles), but I don't think he needs to be returning kicks at all. I'd like to see the Vikes add a big home run threat this off-season like the Bears have with Devin Hester or like the Jets have with Leon Washington. But then again, so would everyone else. I really don't like Childress, but I don't think that's a surprise if you read this. I think that he has a few good ideas like his "good person, before good player theory", but he needs to not take it so far. I knew the Vikings were doomed in '06 the moment we cut Koren Robinson. I know that he's not a good example since he was suspended anyways, but he was definitely our biggest offense threat and he was cut because of Childress' theory (I know he would've gotten disciplinary actions regardless, but Childress have been very stern with this theory). This isn't grade school football anymore, the best players are going to make the biggest impact, and it's just an added benefit if they are good people as well. I'm not endorsing that we become the Cincinnati Bengals and have talented players and don't control them, but we need to have a balance. I hate the offensive and defensive scheme's we run. Our quarterback and wide receivers are not fit for the West Coast Offense. Our offensive line should be man-to-man blocking and not zone-blocking. And I've never been a fan of the Cover-2 (aka Tampa-2) defense we run. We've left our corner backs very susceptible to giving up big plays and I really wish we would've never implemented the T-2 defense in the first place. But I suppose if we ran it correctly, it may be a different story. Perhaps it's our players and not all the coaches fault. But I'm still very critical of Childress for his decisions he's made these last two seasons. I like the direction that our team is going, but that's mainly because of our strong offensive and defensive lines and Adrian Peterson running behind our moving trucks of Matt Birk and Steve Hutchinson. What are your thoughts of the team? Are my grades out of line? What do you think needs to change? Are the Twins really Coo Coo? Torii's Sleeping With The Enemy!